Israel In Prophecy » KeyIssues/ISRAEL'S HISTORY - why is it so unique?? ISRAEL'S HISTORY - why is it so unique? "How shall I curse whom God has not cursed? And how can I denounce whom the LORD has not denounced? "As I see him from the top of the rocks, And I look at him from the hills; Behold, a people who dwells apart, And will not be reckoned among the nations. The LORD did not set His love on you nor choose you because you were more in number than any of the peoples, for you were the fewest of all peoples, but because the LORD loved you and kept the oath which He swore to your forefathers, the LORD brought you out by a mighty hand and redeemed you from the house of slavery, from the hand of Pharaoh king of Egypt. And many peoples will come and say, "Come, let us go up to the mountain of the LORD, To the house of the God of Jacob; That He may teach us concerning His ways And that we may walk in His paths." For the law will go forth from Zion and the word of the LORD from Jerusalem. And He will judge between the nations, And will render decisions for many peoples; And they will hammer their swords into plowshares and their spears into pruning hooks. Nation will not lift up sword against nation, And never again will they learn war. And foreigners who bind themselves to the LORD to serve him, to love the name of the LORD, and to worship him, all who keep the Sabbath without desecrating it and who hold fast to my covenant-- these I will bring to my holy mountain and give them joy in my house of prayer. Their burnt offerings and sacrifices will be accepted on my altar; for my house will be called a house of prayer for all nations." The Sovereign LORD declares-- he who gathers the exiles of Israel: "I will gather still others to them besides those already gathered. "I know their works and their thoughts; the time is coming to gather all nations and tongues. And they shall come and see My glory. I will set a sign among them and will send survivors from them to the nations: .to the distant coastlands that have neither heard My fame nor seen My glory. And they will declare My glory among the nations." The first account I composed, Theophilus, about all that Jesus began to do and teach, until the day when He was taken up to heaven, after He had by the Holy Spirit given orders to the apostles whom He had chosen. So when they had come together, they were asking Him, saying, "Lord, is it at this time You are restoring the kingdom to Israel?" He said to them, "It is not for you to know times or epochs which the Father has fixed by His own authority; but you will receive power when the Holy Spirit has come upon you; and you shall be My witnesses both in Jerusalem, and in all Judea and Samaria, and even to the remotest part of the earth." ...when the fullness of the time came, God sent forth His Son, born of a woman, born under the Law, so that He might redeem those who were under the Law, that we might receive the adoption as sons. He chose us in Him before the foundation of the world, that we would be holy and blameless before Him. In love He predestined us to adoption as sons through Jesus the Messias to Himself, according to the kind intention of His will, to the praise of the glory of His grace, which He freely bestowed on us in the Beloved. I will also be diligent that at any time after my departure you will be able to call these things to mind.For we did not follow cleverly devised tales when we made known to you the power and coming of our Lord Jesus the Messias, but we were eyewitnesses of His majesty.So we have the prophetic word made more sure, to which you do well to pay attention as to a lamp shining in a dark place, until. Our Conclusion: God's eternal plan of salvation conceived before He created the cosmos centers on the people of Israel, a special nation that He brought into being. Through the history of the Jews He prepared the world for the coming of Jesus/Yeshua the Messiah born as a Jew whom He called His "Son." 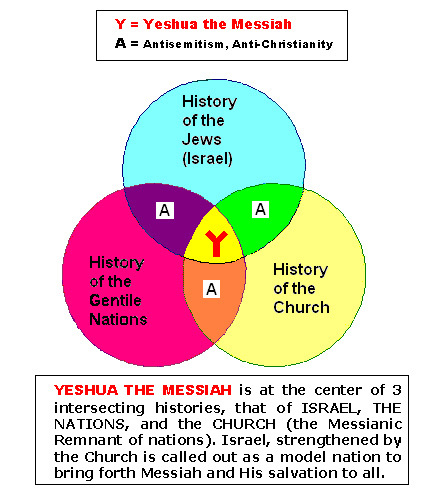 The meaningfulness of Israel's history, its uniqueness and contrast to all other histories is the story of how God used those Jews to provide the unique solution to the problem of man's pride of rebellion and sin, the Messiah, and how he is using them and will use them to finally get the attention of the nations. According to His plan Israel became the womb from which the Church was born in order that Jews and Non-Jews together should bring the Gospel of that salvation to the nations. The unity between the two, Israel and the Church, was to assure the credibility of that mission until the Messiah will return as the ruler of the nations, purging the world from his arch-enemy. God's plan will be accomplished when the Messiah sets up His eternal Kingdom with its capital of Jerusalem. From there He will rule the nations in righteousness and they will submit to Him. Israel's prophetic significance is that it is God's warranty that His plan will be fulfilled in history. His kingdom of peace will come and He will truly be "Emmanuel," God living among man. - Prophecy regarding the future turns into prophetically significant contemporary history, a window of eternity. Workers compensation claim new york Magnificent website. A lot of helpful info here. I'm sending it to some friends ans additionally sharing in delicious. Just what the dtocor ordered, thankity you! The glory is here on earth. The wealth is being transfered. the Lord is visiting the churches and preparing his bride. Are you truly saved,is your spiritual eyes and ears open to see the Lord.